Although bright, shiny, and new inside and out, the heart and soul of Katie’s as an old-school, family operated neighborhood restaurant, still echoes the vision of Mr. Leo Leininger. Katie’s opened as a corner lunch restaurant in October 1984, following the rich tradition of New Orleans neighborhoods. 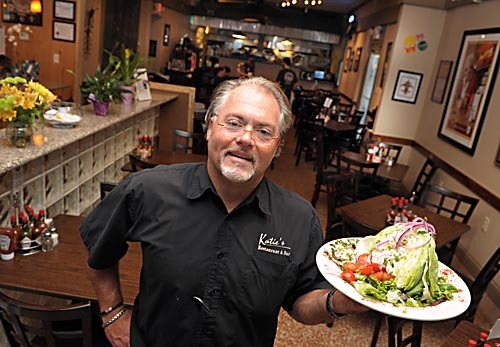 Like so many other renowned eateries, Katie’s is family owned and operated. Founded by Mr. Leo Leininger in the wake of the sagging oil industry, it was his fresh start in a new career. Katie’s was actually the idea of Mr. Leo’s daughter Cathy and they named the establishment after her grandmother. Sadly, Mr. Leo passed away in 1987, yet his family continued to operate the burgeoning neighborhood favorite vigorously, with his undaunted spirit. In December 1993, the Leininger family sold Katie’s to the Craig family, who officially began building their legacy in January 1994. With over 20 years in the restaurant and service industry at the time, Scot Craig took the helm. The hard work and dedication of his brother David and mother, Mary, enabled Scot to expand the operation into a full-service restaurant and bar. With “the boys” in the kitchen, Mary became known as “The Hostess with the Mostess”. She kept the dining room organized and kept the customers happy, full, and returning time and again. The recipe worked; Katie’s enjoyed a full decade of great success and became an indelible mainstay of Mid City. The flood of business Katie’s enjoyed gave way to a destructive torrent in August 2005 when Hurricane Katrina washed seven feet of water through the restaurant and devastated everything. What Katrina did not remove with her wrath, looters removed with their disrespect and greed. With barely enough insurance proceeds to repair his home, which is above the restaurant, Scot feared Katie’s might be doomed. Unrelenting, in the four and a half years to follow, Scot Craig worked to rebuild his life and Katie’s. On March 1, 2010 Katie’s opened its doors once more. With state-of-the-art kitchen equipment, climate control, bar system and a real Brooklyn-style stone pizza oven, Katie’s belated silver anniversary marked a new beginning. In a city that is still working toward recovery, it is good to know the “neighborhood restaurant” did not get lost in the flood. Katie’s is a testament to that. Also in March, Katherine D’Aquin a native New Orleanian and former Katie’s server & bartender returned from a six year stint in New York City to help Scottie return Katie’s to her former glory. In June 2010 Katherine became a partner in the ownership of Katie’s. Although bright, shiny, and new inside and out, the heart and soul of Katie’s as an old-school, family operated neighborhood restaurant, still echoes the vision of Mr. Leo Leininger. You’ll be greeted and seated by the Hostess with the Mostess and Scot is still in the kitchen with Katherine working the dining room and bar. Additionally, you’ll see “honorary” family and loved ones, pitching in and doing their part. When his school and homework schedule permits, young Conner Craig, protégé to his father, also helps out wherever he is needed most. Thank you for dining at Katie’s and welcome to the Katie’s family!